Four impressive originals in this set are by John Coltrane. The title number, "Blue Train," is a moving eerie blues. Trane rides swiftly down a lonesome track with Lee Morgan and Curtis Fuller shoveling extra coal into the boiler near the end of his solo. Lee follows with an energetic statement and is succeeded by a gutty Fuller. John and Lee riff behind Curtis just before he gives way to funky Kenny Drew. Paul Chambers takes a brief but effective solo before the group returns to the theme. "Moment's Notice" is a happy romper with expressive solos by Coltrane, Fuller, Morgan, Chambers (bowed) and Drew. 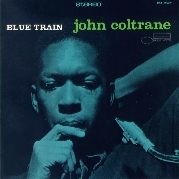 "Locomotion," an uptempo blues begins with a rocking drum statement and a unison riff theme with Coltrane taking off on several "breaks" in between the repeated pattern before moving into his actual solo which, like those of Fuller, Morgan, Drew and Philly Joe Jones who follow, is played in a hard, slashing fashion. "I'm Old Fashioned," a pretty, old popular song that was suggested to Trane by a friend is rendered a delicate treatment. Here John is given a chance to display his warm handling of a ballad and shows himself to be adept with tunes set in any tempo. Curtis, Kenny and Lee are also provided with solo space and their intepretations are sensitive and poignant. "Lazy Bird" is faintly reminiscent of Tadd Dameron's "Lady Bird." After a short piano introduction Morgan (with a brief assist from the other horns), Fuller, Coltrane, Drew, Chambers (with bow) and Jones, take off in that order. Lee returns at the end to ride out over John and Curtis with the theme. What is perhaps the most striking attribute (among many) about this LP is its free, but not disorganized, blowing mood that has everyone in exceptional form both individually and collectively. --ROBERT LEVIN, from the liner notes. In late 1956 or early 1957, John Coltrane went up to Blue Note's offices to ask Alfred Lion for some Sidney Bechet albums (this was four years before he would pick up the soprano saxophone himself). He and Alfred talked about a record deal, but Francis Wolff, who handled the artist contracts, had gone for the day. Coltrane took his Bechet LPs and a small advance, saying that he would come back in a few days. He didn't, and the whole incident seemed forgotten. In early 1957, Coltrane signed with Prestige Records. But he'd remembered the discussion with Alfred and the advance and insisted upon making an album for Blue Note to honor his commitment. The rhythm section that he selected was pianist Kenny Drew and his bandmates from the Miles Davis quintet: Paul Chambers and Philly Joe Jones. This quartet had recorded "Chambers' Music" the year before in LA under Paul Chambers' name for Alladin's Jazz West label. It's not known whether it was Coltrane or Alfred Lion who added Lee Morgan and Curtis Fuller, both recent Blue Note signings, to the front line. The Ultimate Blue Train, Blue Note.